Commonwealth Distance Learning (Masters) Scholarships for 2019-20 are now open for Commonwealth Countries including Pakistan. Commonwealth Distance Learning Scholarships are Fully Funded Scholarships offered by the UK and funded by Department for International Development (DID). Candidates who wish to remain in their home country while they study are encouraged to apply. These Scholarships are offered in the selected fields of study. 1) Must be a permanent citizen of Pakistan or other Commonwealth Countries. 2) Must hold at least upper-class Bachelors Degree. Candidates with lower qualification may be considered if they have relevant experience in the related field. 3) Unable to afford the study without this Scholarship. Note: Candidates must not take any study while availing this Scholarship. What the Scholarship will Cover? 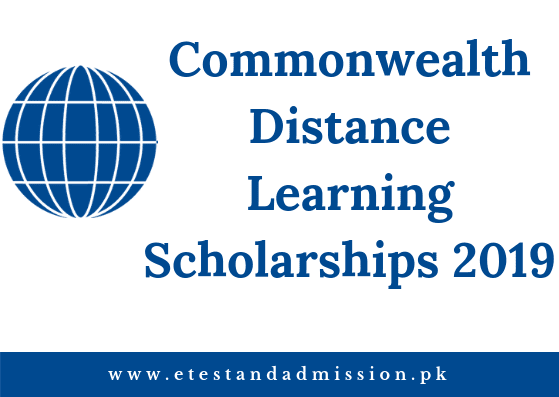 Commonwealth Distance Learning Scholarship will cover the Full Tuition Fee and other compulsory costs of the Program. Which Documents you will require during the Online Application? Candidates can apply via the link given below. Signup for a new account. After signing in to your account, fill the required details carefully and attach the required documents. Note: Before applying, candidates are advised to check the relevant criteria, rules, and requirements of that specific University.